Accurate property data is important to local government. Accurate data is the key to revenue sustainability within the public sector. Geospatial reporting enables municipalities to view data discrepancies and unlock “unknown” revenue. Where data discrepancies are flagged, data cleansing should be implemented. 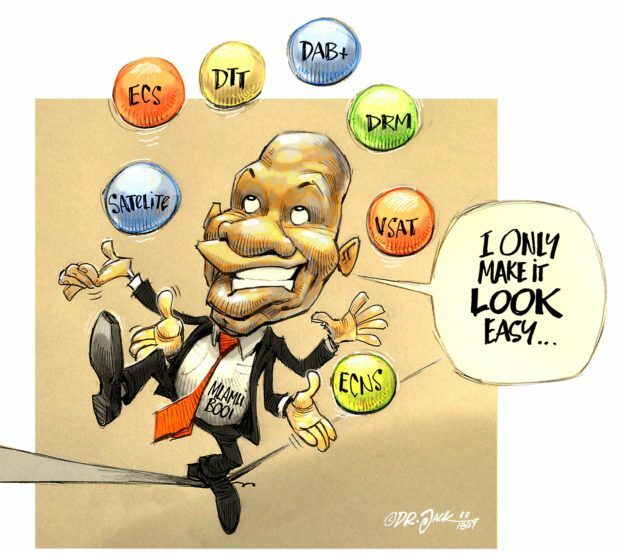 National Treasury embarked on a business reform to streamline and promote consistent financial reporting. To achieve this, the municipal Standard Chart of Accounts, or mSCOA, was regularised and came into effect in July 2017. Its aim is to standardise how municipalities classify their financial data by introducing a standardised classification Chart of Accounts (or general ledger) across all municipalities. There have been various versions of the chart, starting with Version 3.5.1; Version 6.3 will be released in December 2018. All municipal transactions must be reported against seven different reporting segments. One of these is the regional segment, where revenue is generated or where expenses are incurred. A further requirement is that all the municipal systems are integrated through an automated application. mSCOA refers to this as “seamless” integration. There must be a unique identifier within each of the two autonomous municipal systems to enable this linkage. Finally, there is a requirement for mSCOA to provide a “single version of the truth”. 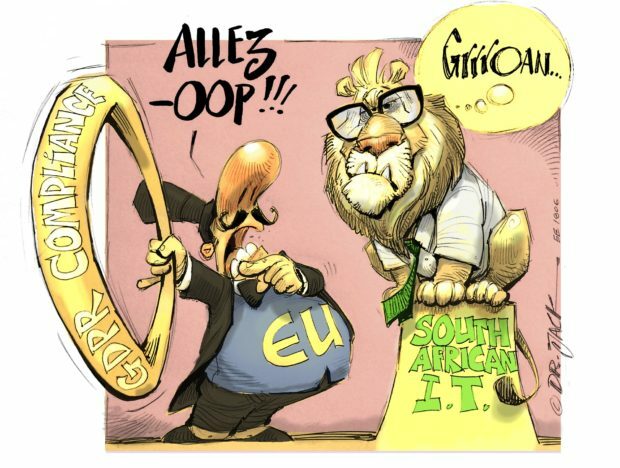 So, for instance, if a municipality had a GIS in the electricity, water and valuations departments these must be consolidated into a single version of the truth or source data. All the framework requirements are regulatory and are being evaluated by National Treasury and their provincial counterparts. This article focuses on the property register, which provides the single version of the truth for all property-related data within a municipality. There is a provision for a municipal property register within the Local Government: Municipal Property Rates Act 6 of 2004 (MPRA). Generally, this scope is delivered to municipalities as a tabular register. This falls short of the mSCOA requirements which prescribes a geospatial register for the regional segment reporting. Table. 1: Breakdown of the 32-digit surveyor general code. To enable compliance with the prescribed integration requirements there must be a common unique identifier between the two autonomous systems. The original 21-digit key was expanded to 26 digits to accommodate sectional title schemes and units. 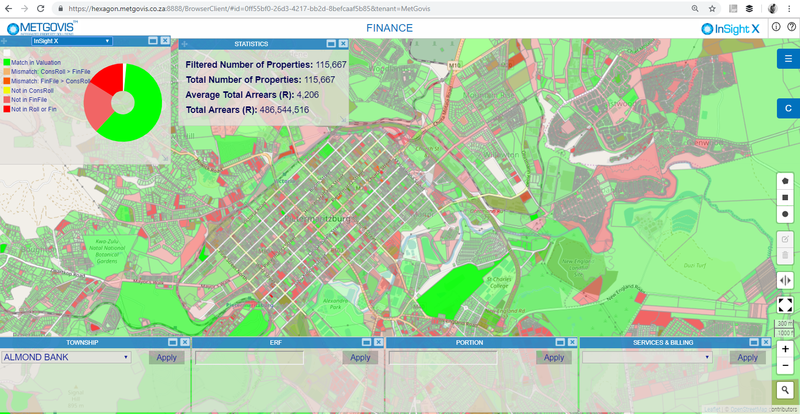 There are further requirements to enable full regional segment reporting for multiple purpose properties, developers interest, exclusive use areas and unregistered properties. This results in a 32-digit spatial locator key which links data between the financial system and the property register. Multiple purposes are defined as properties where there is more than one use (section 8, MPRA). 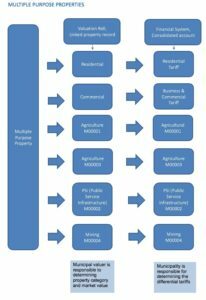 From 1 July 2022, municipalities must include this category of property within their rates policies. The implications are that the appointed municipal valuer must value each use and apportion the market value on a pro rata basis across the various uses. The municipality must attach the respective tariff to each of the apportioned values. The regional segment will be able to report on the spatial location of each of the apportioned uses. Table. 2: Linking the multiple purpose property and municipal financial system. 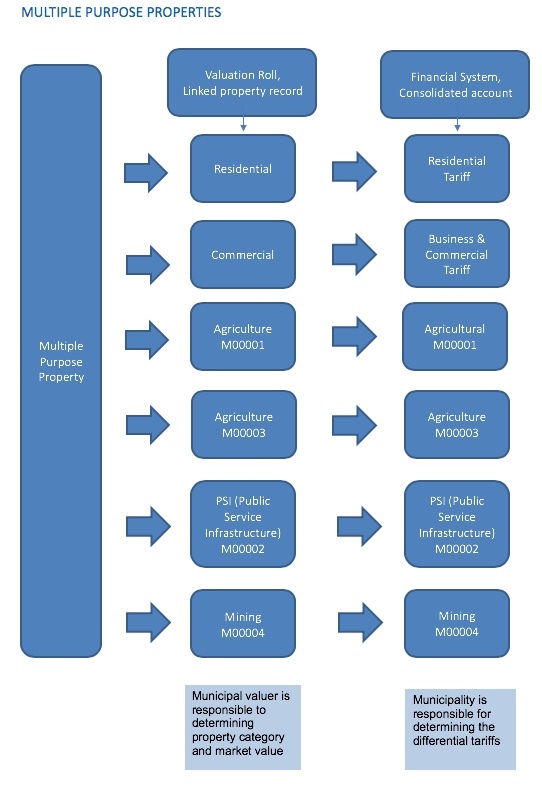 The respective land uses are: Mining, public service infrastructure and agriculture. The valuer will apportion a market value to each land use. The municipality will attach the mining, PSI and agricultural category tariff and any relevant rates policy relief to each of the apportioned values. The municipality’s billing system will consolidate the ratepayer account to reflect the total amount due for property rates. Most municipalities datasets require data cleansing. It is not enough to establish a property register. While property is immovable it is not static. Property is bought and sold, which triggers an ownership change. Property is sub-divided and consolidated, improvements are constructed, old buildings are demolished. Various processes accompany these actions, e.g. re-zoning resolutions, or building completion certificates that prompt a change in valuation. Section 78 of the MPRA requires all changes in value to be maintained through supplementary valuations. The initial establishment and investment in the spatial register must also be routinely maintained. MetGovis’ InSight X is a geospatial revenue management reporting tool which provides an overall picture on debt age analysis, accurate billing and discrepancies within municipalities. The dashboard is capable of showing billing anomalies and supports resolving customer queries in real-time. Fig. 1: A dashboard for finance users to identify discrepancies between the financial system and the valuation roll (market value, category, extent). Billing anomalies which need to be remedied can be flagged to avoid revenue slippage. The challenge facing most municipalities is cash flow and accounting for expenses. National Treasury introduced the Municipal Standard Chart of Accounts, mSCOA, which prescribe municipal reporting formats, namely that each financial transaction within local government must be reported against a series of prescribed accounting segments. The segment of most importance for geospatial reporting is the regional segment. The regional segment enables decision makers to view reports on a spatial platform, such as InSight X. InSight X reports may now be updated as and when required. Advanced reporting tools like these can be used by municipalities and organisations to enhance revenue management and financial accountability. National and Provincial Treasury departments may have access to the online platform to view and monitor revenue performance per municipality. Municipalities usually run their various business units as separate entities, each with their own datasets. mSCOA prescribes seamless integration between the financial system and the respective sub-systems. The financial system, the property register and the valuation roll management system are all linked through an automated programmatic interface (API) to report seamlessly. Fig. 2: A dashboard displays the status and progress of Municipal Infrastructure Grant projects. 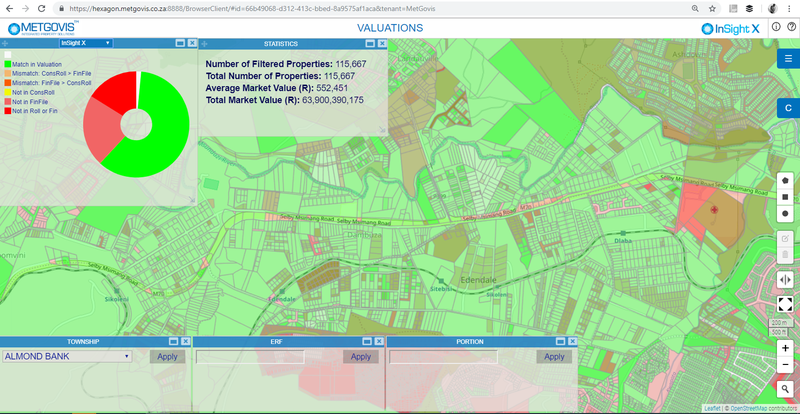 Previously the InSight platform used to generate static maps which highlighted the data discrepancies between the financial and billing data, the valuation roll data and the cadastral datasets. The reports were presented as static maps with supporting record schedules which informed the required data cleansing. The platform has since migrated from the static model to a live platform where datasets are updated via the API with the financial system on a real-time basis or as required weekly or monthly. Good data is a process. It does not just happen, it requires a consistent investment and maintenance by each respective municipality. A record-by-record alignment between the property register, the valuation roll, and the financial system will provide an immediate escalation in revenue for any municipality. The InSight X platform enables users to report where money is spent on services and where revenue is originating, and its regional segment with its locational references drives business intelligence. Fig. 3: Dashboard with valuation and property related information such as the rates and market value per property. Initial requirements include an accurate and complete property register and intense data cleansing. Ongoing maintenance is a must. 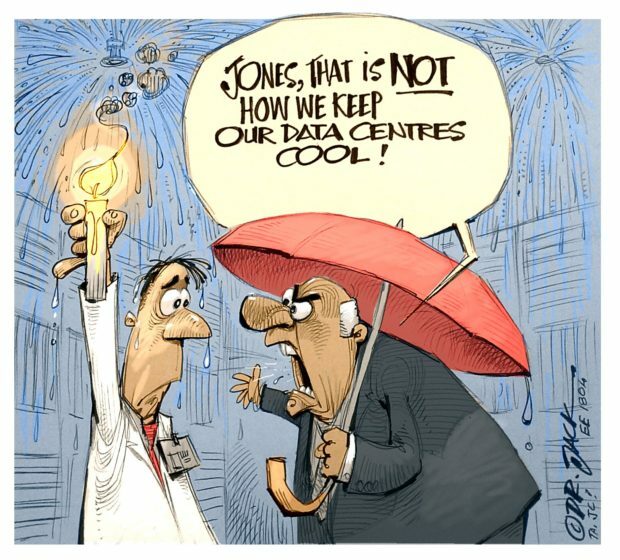 Incomplete and inaccurate datasets which are not maintained are a liability to the municipality. Municipalities need to guard against using flawed datasets to inform their processes. Unless property data is accurate, disconnections and other unpopular enforcements may be misdirected. This is a real risk to the municipality. The RT25-2016 business streams position the property register within the valuation roll management system. This is a logical selection as the property register is provided for within the Local Government (MPRA 6 of 2004, section 23). 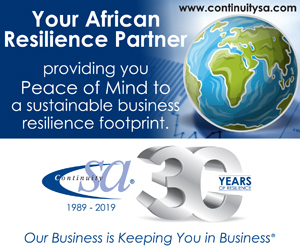 The challenge is that most municipalities have not yet elevated their existing tabular registers to the geospatial property registers required to report transactions against a locational or regional segment. The geospatial registers enable mSCOA compliance, the tabular registers fall short of this requirement. While property registers are established they also require continuous maintenance, since property is bought and sold, sub-divided, consolidated, buildings are completed, and re-zoning applications are approved. All these section 78 (MPRA) attributes trigger a change in the value of the respective properties. These changes are required for the supplementary valuations and valuation roll maintenance. Supplementary valuations require a re-valuation of the properties to reflect the adjusted market value of the property as a result of the change in the attributes. The MPRA amendments enforce roll maintenance to smooth the cash flows for municipalities and to incur the least prejudice to the ratepayers. Most municipal officials do not hold financial qualifications, yet they are required to make continuous strategic decisions which influence the sustainability of their municipalities. Senior decisions makers are under pressure to perform with work pressure and capacity constraints. The challenge which tools such as InSight X address is to present data, both financial and non-financial, in an accessible and clear way. It provides dashboards which enable clear decision making and place accurate information at the user’s fingertips. If municipal managers and mayors are able to see the data they are working with, then decision making ought to be easier and more accountable. Spatial platforms can also complement the existing monthly section 71 reports. Fig. 4: Overview of the project progress of a general valuation project, highlighting the state of each property. Dashboards may be customised for the select view sought by the user. Users in the Water Department may wish to see revenue for water services per erf, the debtor age analysis for the water services, water meter reading data (actual vs estimated) data of where to locate tampered or damaged water meter units or to locate areas within the municipality where no water meters are installed and no water services are rendered. Another example is returned accounts. This is an escalating phenomenon for municipalities as the economy slows and the ratepayer capacity to pay shrinks. Tools such as InSight X are able to report on which registered owners or ratepayers return their municipal accounts, and whether these account holders are the registered owners of the properties. With this data at hand, the municipality may proceed with confidence to collect from the defaulting ratepayers. Experience shows that service availability charges are often inaccurate, and InSight X can match the respective erf with the relevant charges to ascertain whether billing is complete and accurate. The InSight X reporting platform can process data from the national or provincial level down to the individual erf within each participating municipality. Ratepayer queries may be addressed within council meetings provided that the property register is accurate and up to date. Information is power. It will be empowering for the municipal managers and CFOs to visualise the data on their smart phones, enabling them to address the queries and immediately return the details required.